When you have less than stellar credit, you might be tempted to take whatever loan you can get. While this might result in high interest rates and uncontrollable payments, Ascend Consumer Finance helps you avoid all these problems with their innovative lending technology. The company looks at more than your just your credit scores, and even lets you lower your interest cost by exhibiting good financial behavior. With excellent rates and a strong focus on helping you improve your financial health, Ascend Consumer Finance provides a superb personal loans service. When it comes to loan terms, Ascend offers a fairly standard timeframe for loan repayment. The company’s loans come with a term of 36 months. Because Ascend Consumer Finance is focused on offering you loans to help improve your financial health, the company does not offer variable terms. Unfortunately, this puts them at a disadvantage when compared to other competitors. However, offsetting this drawback is their outstanding RateRewards program which is designed to help you lower your interest costs and pay debt off quicker than the established term. Additionally, the company encourages you to completely pay your Ascend loan before the full term as there are no early payment penalty fees. One of the things we really appreciated when researching Ascend Consumer Finance was that the company places no limits on what you can do with your loan. While they recognize that loans are an important part of restoring your financial health, there are no set preconditions for loan purposes and applicability. When it comes to loan amounts, we were happy to see that the company offers credit between $2,600 and $12,500, though the lower end of the range might vary depending on your state of residence. The company offers loan interest costs between 27.49% and 35.99%, though you can dramatically improve those interest rates thanks to the company’s RateRewards program. 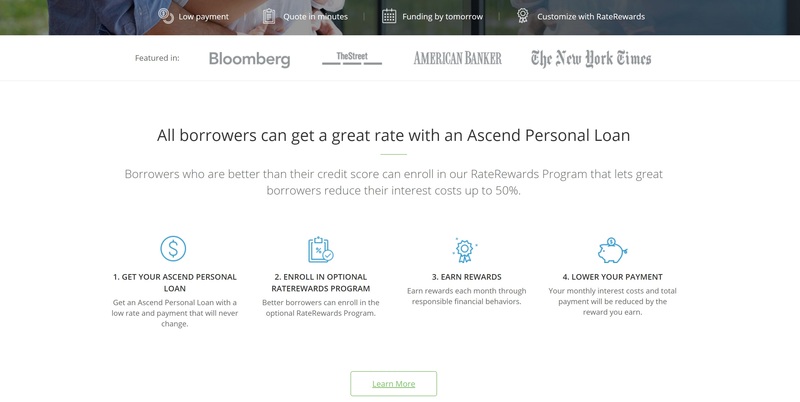 RateRewards leverages Ascend’s proprietary “adaptive risk pricing” to reduce your interest cost by up to 50% when you exhibit positive financial behaviors such as on time payments, saving money every month, or paying off your credit card debt. Ascend believes that credit scores are not the only indicator of your financial responsibility or creditworthiness, so they look at a broader cross-section of your profile when offering you a loan which is one of the reasons they work with scores as low as 580. To supplement credit scores, Ascend looks at your employment, income, and bank account history to create a more comprehensive view of your credit-worthiness. If approved, you will be offered a choice between a standard personal loan and Ascend’s proprietary RateReward loan. Ascend offers a simple recommendation to help you understand which loan option is right for you. One area we felt Ascend could use some improvement is with their knowledgebase. 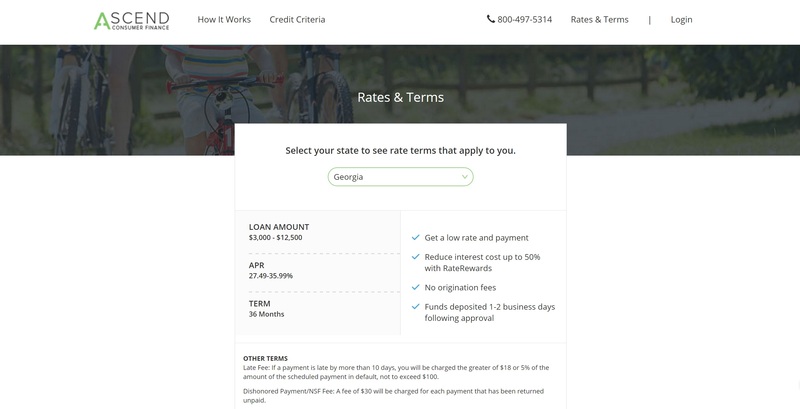 They do offer an incredibly helpful FAQ section, as well as a great tool that lets you calculate your interest and loan amount depending on your state of residence. However, the absence of a detailed guide on the loan process or the implications of personal loans on your financial well-being would be extremely helpful resources. They do encourage you to actively improve your financial behavior, which is a plus when getting a financial product that has potential long-term risks. Nevertheless, it would be nice to see a more in-depth look at the steps you can take to improve your personal financial health. While it is not hard to get a quote when you apply with Ascend Consumer Finance, the process can take some time to get through. The application takes you through a few pages, and asks you for standard information such as your name, a valid e-mail, and some employment details. However, it also requires your personal banking information—though only with viewing capability—in order to participate in their RateRewards program. While that was more information than some competitors require, it does pay off in the long run, as it can help you access much lower rates if you are responsible about your finances. Despite some minor limitations and setbacks, Ascend Consumer Finance represents an intriguing and important break from traditional lenders. By offering loans to borrowers with weaker credit and rewarding positive behavior, Ascend Consumer Finance can be of great benefit if you are looking at your loan as a mechanism to rebuild your financial health or just require emergency funds. With great offerings and respectable rates, Ascend Consumer Finance represents a great opportunity for borrowers with a more checkered credit history.